Quality handmade candles make great gifts for your friends and family. If you're wondering how to make an excellent high scented jar candle, you've come to the right place! When studying how to make an excellent high scented jar candle, you may find yourself wondering if the answer is to simply double the amount of fragrance oil listed in your candle making recipe. At first glance, this might seem like an easy solution to your problem. More oil should equal a stronger scent, right? Unfortunately, it's not that simple. It may be helpful to think of wax as a sponge-like material. Once you hit a certain point, you can't add any more fragrance oil. It will just seep out of the candle like a sponge that is overfilled with water. Then, the candle won't burn properly because you'll have pools of liquid in it. This also represents a serious safety hazard since the entire candle-not just the wick-will be flammable. Many people like to use essential oils for making aromatherapy candles, but it is believed that essential oils don't throw scent as well as fragrance oils. Look for fragrance oils that are designed to be used exclusively with candle making. Fragrance oils that are multi-use can be used to create candles, soaps, lotions, and perfumes. However, being formulated for more than one use means they lack some of the ingredients that optimize them for creating scented candles. Consider making candles from soy wax. Soy candles tend to be known for their ability to distribute scent evenly. Many people say they last up to 50 percent longer than candles made from paraffin wax. 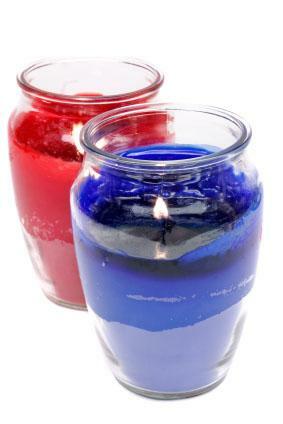 If you're making candles from paraffin wax, add ¼ to ½ teaspoon of the additive Vybar 260 to your container blend. This is a binding agent that will make sure the wax holds the fragrance evenly, so your candle scent is consistent throughout. When adding fragrance oil to your candles, wait until the wax measures 180 degrees. Wax starts to melt between 120 and 150 degrees, but it needs to be hot enough to allow the fragrance oil to fully "bind" with the wax in order to produce the best results. For the best scent throw, your candle's melt pool should be approximately ¼ inch thick. Vary the wick size up or down until you hit this measurement. When you're not busy making candles, store your fragrance oils in a place where they won't be exposed to light. Quality scents will start to degrade when exposed to light for any period of time. For more candle making tips, check out the LoveToKnow Candles articles on Container Candle Making Instructions, Making Scented Candles, and Safe Candle Making.